With active MultiMoveClip, with USB-cable with cig-plug adapter. 12/24V. With tilt swivel. The choice for you who use your device every day in a rough environment! 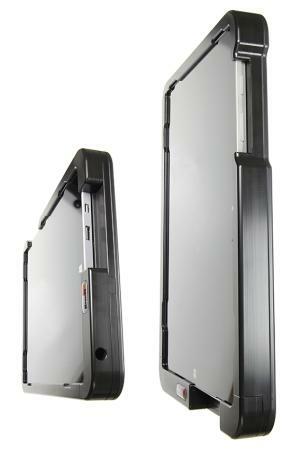 Your device is well protected in a heavy duty tough sleeve, in the same time as it gets charged. You can easily take the device with you and move it between vehicle-vehicle or vehicle-office. First you place your device in the heavy duty tough sleeve, which is a robust case/jacket with built in bumpers. 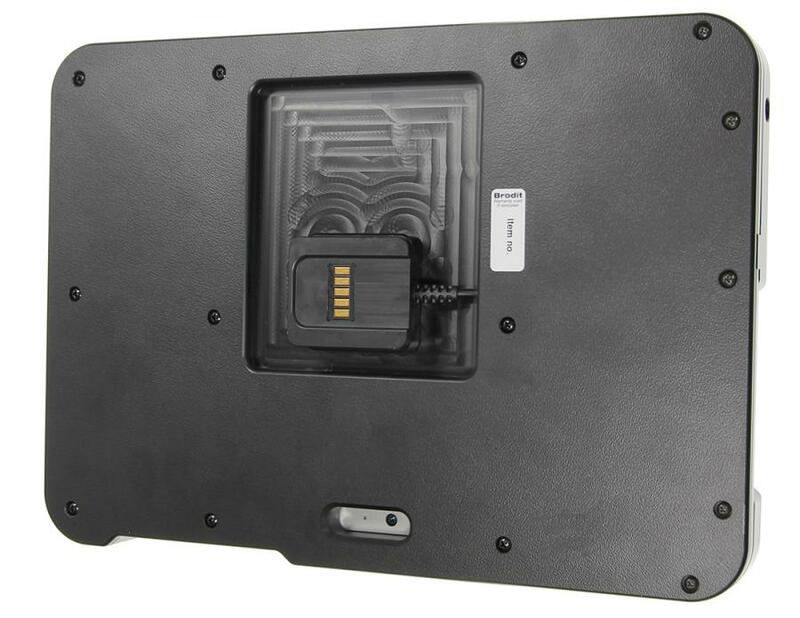 The bumpers reduce vibration and help protect the device if dropped. Then you attach the sleeve onto an active MultiMoveClip by pressing it downward onto the mount. 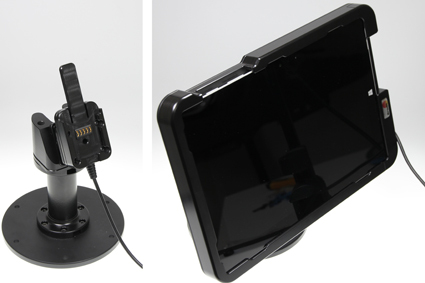 When it snaps into place, the charging is automatically connected via the Sliding Power Block. Thanks to the quick connector, you also remove the sleeve from the MultiMoveClip in an instant. The charging connector is durable to withstand frequent wear in everyday professional use. The device is firmly in place in the sleeve and can not be removed without loosening the screws. You have full access to the camera and all buttons when the device is in the sleeve. With USB cable with cig-plug adapter. 12/24V. Equipped with a tilt swivel so you can easily switch between portrait and landscape mode. Made of black ABS- och Acetal plastic. Made in Sweden. 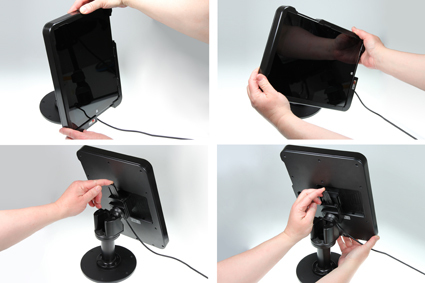 Attach onto a Pedestal Mount or extra strength mounting platform. Sleeve Dimensions: 296 x 207 x 35 mm (W x H x D mm). MultiMoveClip with Sliding Power block with USB-cable with cig-plug adapter: Builds 35 mm to the sleeve depth. Cable length 102 cm + 58 mm cig-plug adapter. Weight 131 g.
Please read all of the instructions and look at the pictures before installing. 1. To place the device in the tough sleeve: Slide the device sideways into the sleeve. Carefully connect the charging connector to the device. NOTE: It is very important to hold the connector straight in front of the device and connect it straight into the device (if you angle the connector/place it askew into the device, you risk to damage the connector/device). Place the lid over the connector and attach it by screwing the enclosed screws into place on the back side of the sleeve. 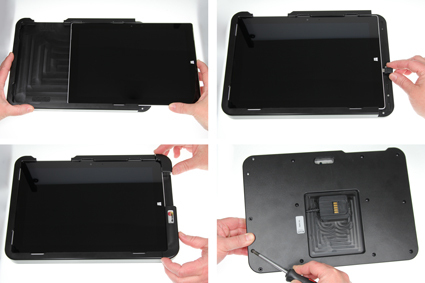 The device is now securely in place and can not be removed without loosening the screws. 2. 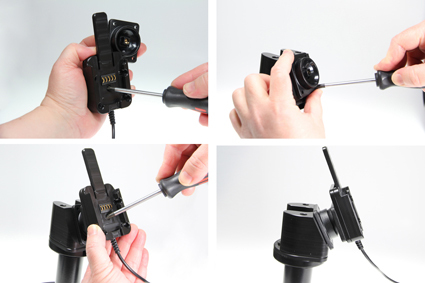 To install the active MultiMoveClip: Loosen the screw in the center of the Power Block so you can remove the tilt swivel attaching plate on the back. Place the attaching plate onto the desired position and screw it into place with the enclosed screws. Place the Power Block over the attaching plate so the screw fits in the hole in the tilt swivel. Tighten the screw until the MultiMoveClip is firmly in place, but still can be adjusted. 3. To place the sleeve onto the active MultiMoveClip: Place the sleeve above the Power Block and slide/press it straight downward into the Power Block so you hear/feel it snaps into place. The device is now connected to the charging. To remove the sleeve from the active MultiMoveClip: Press forward on the release arm on the Power Block so the sleeve is set free. Press/lift the sleeve straight upward, out from the Power Block. 4. The product is in place.